Tetelesthai! I have run the race. I have finished the course. Alleluia. We had a wonderful morning for the run. The weather was perfect and at the moment we have raised £6,207. This is excellent and will make a big difference to the needs of the Tariro charity. Thanks to everyone who has given support, in finance, prayer and friendship. A special word for those who donated through mydonate – many of those who gave did so anonymously and I have no way of writing personally to say thanks. Indeed the same is true of anyone who used that account – there is no direct way to make contact with the donors. So to anyone who I have not been able to write to – a big thank you. Thanks also to my brethren for their patience and to all the students especially the support team today (Lois and Paul). 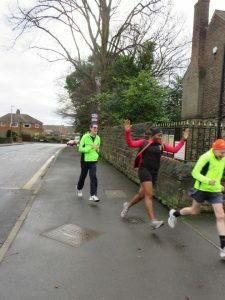 To my fellow runners – Shavaun and Marc – it was great to have you beside me for a six mile slog. Lastly thanks to Nicolas whose efforts on behalf of the kids in Zimbabwe makes my own seem puny. Thanks be to God it was a lot of fun. https://mydonate.bt.com/fundraisers/frjohngribben10krun remains open until 26th March so it is still possible to donate.